“Written Communications from Gen. Warren”? Lydia Barnard: “She Captured a Redcoat”? Bank of America: The Story of US? The second draft has somewhat different wording but the same sense. Revere wrote nothing in either version about carrying a written message. Furthermore, there are significant differences between what Revere recalled that Dr. Warren knew when he left Boston and what the Rev. Jonas Clarke of Lexington wrote a year later. 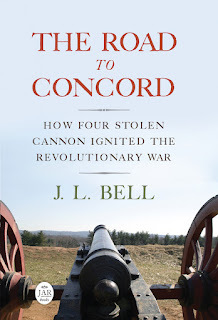 Clarke said the message from Boston included an estimate (much too high) of the number of soldiers, a different location for their landing across the Charles River, and a definite statement that they were headed to Concord. Those discrepancies indicate that Clarke was not quoting a message Dr. Warren had written before Revere began his journey, but working with additional information and perhaps some hindsight. Revere also didn’t mention carrying a written message in his 1798 letter to the Rev. Jeremy Belknap about the start of the war. In fact, in that account the silversmith wrote: “I found Messrs. Hancock and Adams at the Rev. Mr. Clarke’s; I told them my errand,” implying that he delivered the warning from Boston orally. The Rev. William Gordon of Roxbury, who appears to have been close to Samuel Adams, didn’t mention a letter from Dr. Warren in his early account of the day. The traditions passed down in William Dawes’s family, published in 1878, say nothing about a written message. Instead, the evidence indicates that Dr. Warren, Revere, and their colleagues worked to set up a network of messengers whom leaders could trust without needing written confirmation. Revere had worked with Adams, Hancock, and Warren for years. Hancock knew Dawes as adjutant of the Boston militia regiment, and Dawes was somewhat active in politics. Revere visited Lexington a few days before 18 April to prepare the ground. On his way home, he arranged for colleagues in Charlestown to send a rider west based on a signal from the Christ Church tower; obviously, that rider starting on the other side of the river couldn’t have carried a letter from Dr. Warren. But with signals arranged and relationships established, he didn’t need to. At least that’s my interpretation of the evidence. J.L. - your interpretation of the evidence pieces and then applying your logic to the message(s) situation all makes perfect sense. I don't see any other finding from what you have researched and laid out. Good piece of investigation journalism! I agree with Mr. Smith, excellent research and analysis. To my mind the strongest argument against a letter is simply that an oral message means there is no evidence if the messenger is intercepted.